The main services supported by Axway API Gateway are described in this section. For more details, see API Gateway features. Because the API Gateway provides this core API infrastructure, developers can focus on providing the application logic. They no longer need to build these services into their application, and can leverage the core infrastructure provided by the API Gateway. Previously, the API was not treated as a first class citizen, and in many cases was part of the application interface. However, the API Gateway sees the API as a first class artifact, with its own particular constructs, and its own runtime environment. The API Gateway provides all of the same benefits for the API that the application server provides for the application. In this way, it is important to distinguish between the API and the application as two distinct entities. This user role virtualizes APIs and develops policies for APIs. Policies are rules used to govern or manage an API (for example, for security, integration, SLA monitoring, or transformation). This is a technical developer role. This is a business or operational role managing dynamic policy configuration data in a Key Property Store (KPS). A KPS is used to store parameters that are passed into policies at runtime (for example, authorization levels, quotas, or customer details). This means that these details do not need to be configured by the policy developer. This role monitors, manages, and troubleshoots the API Gateway. It has full administrative privileges, including deployment of API Gateway configurations. This is the traditional system administration or operational role for the API Gateway. It involves keeping the API Gateway running, monitoring its operation, managing any settings, and performing any troubleshooting. This user typically works in an upstream staging or production environment instead of in a development environment. This role monitors the API Gateway. It has read-only administrative capability. This is typically a production operations role. This role deploys API Gateway configurations using scripts. It has a restricted deployment role, and is typically used in production environments. 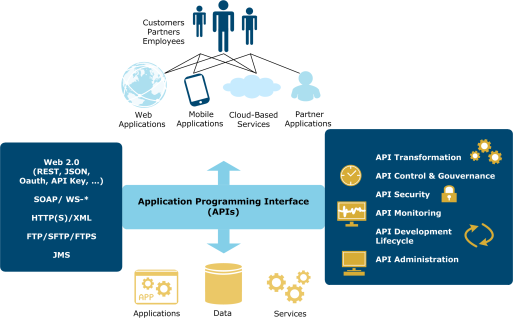 API Gateway provides a comprehensive platform for managing, delivering, and securing APIs. It provides integration, acceleration, governance, and security for Web API and SOA-based systems. This section describes the high-level functionality available in API Gateway. API Gateway integrates with existing third-party Identity Management (IM) infrastructures to perform authentication and authorization of message traffic. For example, integration is provided with LDAP, Microsoft Active Directory, Oracle Access Manager, Computer Associates SiteMinder, Entrust GetAccess, IBM Tivoli Access Manager, RSA Access Manager, and other IM products. API Gateway also interoperates with leading integration products and platforms (for example, Microsoft .NET, Oracle WebLogic, IBM WebSphere, and SAP NetWeaver). 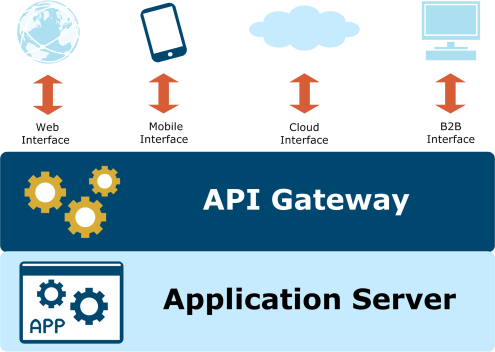 API Gateway is designed to offer a highly flexible and scalable solution architecture. Administrators can deploy new API Gateway instances as needed, and deploy the same or different policies across a group of API Gateway instances as required. This enables administrators to apply polices at any point in their system. Policy enforcement points can be distributed around the network, anywhere traffic is being passed. The API Gateway internal message-handling pipeline is extensible, enabling extra access control and content-filtering rules to be added with ease. Customers do not have to wait for a full product release before receiving updates of support for emerging standards and for additional adapters. The API Gateway REST support enables you to make enterprise application data and operations available using Web APIs. For example, you can convert a legacy SOAP service, and deploy it as a REST API to be consumed by mobile apps. REST-to-SOAP conversion is easy to achieve using the API Gateway. It can expose REST APIs that map to SOAP services, dynamically creating a SOAP request based on the REST API call. API Gateway includes support for multi-byte message data and a wide range of international languages and character sets. For example, this includes requests in languages such as Chinese, German, French, Spanish, Danish, Serbian, Russian, Japanese, Korean, Greek, Arabic, Hebrew, and so on. The API Gateway supports character sets such as UTF-8, KO-I8, UTF-16, UTF-32, ISO-8859-1, EUC-JP, US-ASCII, ISO-8859-7, and so on. You can use API Gateway to offload the heavy lifting of XML from application servers, and on to the network. This frees up resources on application servers and enables applications to run faster. Axway's patented high-performance core XML acceleration engine, coupled with hardware acceleration ensures wire speed network performance. The core acceleration engine is integrated into API Gateway to accelerate the essential XML security primitives. This engine provides XML processing at faster levels than those performed by common JAXP implementations in application servers and other applications that sit downstream from API Gateway. The acceleration engine performs Document Object Model (DOM) processing, XPath, JSON Path, XSLT conversion, and validation of XML and JSON. API Gateway can automatically populate content in XML and JSON documents from sources such as databases. By putting this functionality on to the network infrastructure, data is automatically populated in messages before they reach the consuming services. This simplifies and accelerates applications in ESBs and application servers. API Gateway includes many features that speed up deployment. For example, certificates and private keys, necessary for XML security functions, are issued on board. API Gateway has a deny-by-default defense posture, to detect and block unauthorized deployments of services. Policies can be re-applied across multiple endpoints using simple menus. Policies can also be imported and exported as XML files. This minimizes time needed to replicate policies across multiple API Gateways, or to move from a staging system to production environment. The API Gateway Appliance (physical or virtual) is a pre-hardened appliance running the API Gateway runtime. The API Gateway Appliance is a locked-down environment that requires no installation, and the system can be managed easily using a web-based management interface. A web-based system management dashboard provides centralized control of API Gateways in your domain. API Gateway Manager provides quick and easy access to enable you to manage your API Gateways and services. For example, you can use monitoring and a traffic log to monitor messages sent through API Gateways in your domain. All monitoring data can be aggregated across multiple API Gateway instances in a group or domain. 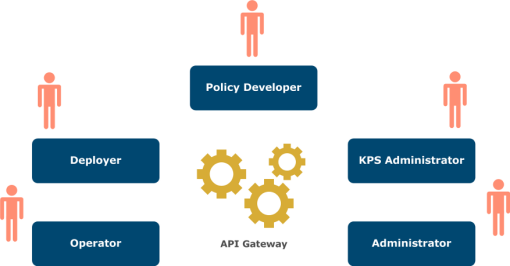 The Policy Studio tool enables administrators to add security and management policies to the API Gateway, and to manage policy versions across multiple API Gateways. This enables enterprise policy management to be brought under centralized control, rather than be managed separately on each API Gateway. The API Gateway Analytics tool provides auditing and reporting on usage across all entry points and creates comprehensive reports to meet operational and compliance requirements. API Gateway Analytics also provides root cause analysis by identifying common failure points in multi-service transactions. If a service fails, and impacts the transaction as a whole, API Gateway Analytics can detect this and generate alerts. API Gateway protects services from unanticipated traffic spikes by smoothing out traffic. It also limits clients to agreed service consumption levels in accordance with service usage agreements. This enables Axway customers to charge their clients for different levels of service usage. Through its support for a wide range of security standards, API Gateway enables identity mediation between different identity schemes. For example, the API Gateway can authenticate external clients by user name and password, but then issue SAML tokens that are used for identity propagation to application servers. API Gateway enables you to secure Web APIs against attack and abuse. It also enables you to govern and meter access to and usage of Web APIs. API Gateway provides support for API management security standards such as OAuth. This enables you to share private resources with third-party websites without needing to provide credentials. API Gateway routes data based on sender identity, content, and type. This enables messages to be sent to the appropriate application in a secure manner. It also enables service virtualization, where services are exposed to clients with virtual addresses to mask their actual addresses for security and application delivery. In this way, the API Gateway acts as an important control point for network traffic by shielding endpoint services from direct access. API Gateway satisfies audit requirements by enabling service transactions to be archived in a tamper-proof store for subsequent audit. Axway also facilitates privacy compliance support by allowing sensitive information, such as customer names, to be encrypted or stripped out of message traffic. API Gateway is available as a physical or virtual appliance, or as software on Windows and UNIX/Linux. For more details on supported platforms, see the API Gateway Installation Guide.